For when She Said Yes just isn't enough... we've got you covered. 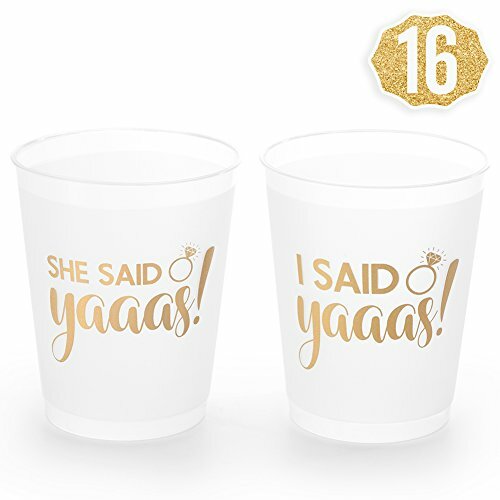 Our 16 pack "She Said Yaaas" + "I Said Yaaas" cups are the perfect supplies to get the party started! Two Styles: 14 "She Said Yaaas" cups for the bride tribe + 2 "I Said Yaaas" cups for the bride (or brides) to be! The Perfect Size: 16 ounces to handle all of the champagne, vodka, beer, etc. that your party has to offer :) no need to constantly refill with our bachelorette cups! Instagram Friendly: our gold + frosted white cups look great on Instagram ;) Just add cute nails, champagne, maybe a pool, and you've got the shot! Long Lasting + Reusable: these frost flex cups have been put through rigourous party testing and are 100% guaranteed to last day into night - the perfect bachelorette decoration for the bride to be!